Most of us speed past the orange road sign that reads “survey crew” without a second thought. Who could imagine that a career that once largely relied on tape measures and boots on the ground is now connected with global positioning systems (GPS) and robotic technology, including drones? “Who wouldn’t want to fly a drone all day long and come back and put that information into a computer system?” asked Professor Chris Cartwright, program head for civil engineering technology at Tidewater Community College. Surveyors provide precise descriptions of surface features of the Earth. They lay the foundation for any number of projects completed by engineers, architects, geologists and developers. Planning to build that chain-link fence in the backyard? Someone has to figure out where to draw the line. 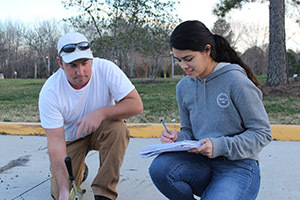 Get the know-how with TCC’s Career Studies Certificate in Land Surveying. Evening and hybrid classes are available, and for the first time in fall 2017, the certificate can be earned 100 percent online. Online-only students can satisfy the lab component of the program by pairing with a licensed land surveyor as a personal mentor. TCC is collaborating with the Virginia Association of Surveyors to assist students in locating mentors. Working with professionals in the field will allow students to gain more real-world experience and better prepare them for using the instruments of the trade. Instead of three- or four-man survey crews to work a job, today employers often rely on the one-man shop approach to a project. “I get more calls from employers in need of surveyors than any other area,” Cartwright said. Graduates of TCC’s certificate program who have at least six years of work experience can sit for the Fundamentals of Surveying Exam. After passing the exam, they earn the designation of State Land Surveyors-in-Training. If graduates complete the Associate of Applied Science in Civil Engineering Technology, they can transfer all their credits to East Tennessee State University’s bachelor’s degree in mapping and surveying, an online program. Virginia-domiciled transfer students are eligible to pay in-state tuition at East Tennessee State. All credits from the land surveying certificate stack toward the associate degree at TCC. Students earning their bachelor’s degree can sit for the Fundamentals of Surveying Exam without any work experience. 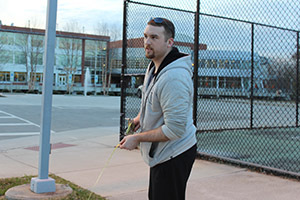 Marine veteran Charles Richardson explored numerous programs at TCC before deciding to earn his land surveying certificate and ultimately his associate degree. Richardson was impressed when, after missing a lab due to a family emergency, his professor came in on his off day to ensure the work was made up. The 27-credit certificate includes classes in geographic information systems, GPS, precalculus and civil engineering drafting. Enjoying math, particularly geometry and trigonometry, is helpful for prospective surveyors. A large portion of the work is often outdoors and no two days are the same. Student Carter Ridgeway, who will graduate in 2018 with the certificate and associate degree, is drawn to a career that doesn’t involve sitting in a cubicle all day. He also values the importance of the actual work. Anyone interested in the program can contact Cartwright at ccartwright@tcc.edu or 757-822-7312.